These Classical Guitar Strings feature smooth, opaque monofilament Bionylon trebles with silver-plated copper over Nylgut multifilament basses. I agree that the trebles are the best part of this set. These strings just worked from day one meaning I loved the mellow sound. And so easy to play. I really love these strings but after trying high tension maybe try their Superior Bass set. Not so long lasting as other more expensive sets but I can live with that. Great romantic sound on my Taurus 53! I liked very much these treble strings, they have nice tension balance. But I feel the bass strings are tighter, they should be classified as medium high tension. Trable strings are superior to all I ever used, but bass strings I would not recommend. 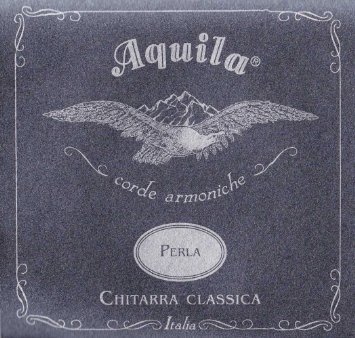 This remark is by my opinion valid for all Aquila classical guitar strings sets. Unfortunately the manufacturer is not offering only trebles sets, but for playing it is worth to combine Aquila trebles with basses of other companies.